In this edition John answers questions on the unofficial world champions, Blackrock College Lions, the world's most capped lock, Heineken Cup pool stage records and windy days in New Zealand! This system uses the boxing concept that the winner of any title match is the world championship-holder and in the last column the list was given up to 1938, when the Lions took the title from South Africa. Deliberate mistake - well spotted ….! Yes, you're right of course, and several others were quick to point out the slip. O'Driscoll was the eighth Blackrock College Lion and Luke Fitzgerald the ninth. 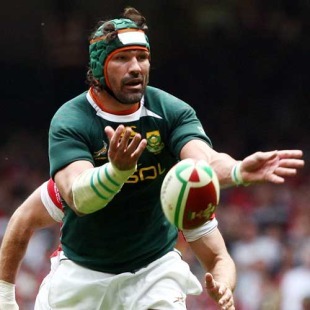 Victor Matfield, South Africa's most-capped player, has won all 105 of his Test caps in the middle of the second-row. Fabien Pelous won 118 caps for France but 18 of his starts were as a No.8. In the early years Toulouse won both their pool matches before going on to lift the inaugural Heineken Cup (1996). Leinster also won both their pool games that season but were knocked out by Cardiff in the semi-finals. Brive won all four of their pool matches before winning the competition in 1997 (beating Leicester, who had also won all four of their pool matches, in the Final). Arguably some of the windiest matches in rugby history have involved New Zealand. Their first Test of the 1913 home series against Australia was played at Athletic Park on a very wet and windy Wellington day. The referee took pity on the sides and broke the game into four quarters - the only time this appears to have happened in a Test. NZ won 30-5. Forty-eight years later, France experienced similar conditions at Athletic Park on their first tour of New Zealand. On the morning of their second test of the 1961 series, gusts of 80 mph were recorded and the SS Canberra, on her maiden voyage, was prevented from berthing in Wellington harbour. New Zealand won the Test 5-3, Don Clarke converting a try by Kel Tremain. Jean Dupuy scored France's try. The 1989 All Blacks in Wales experienced one of west Wales's worst days when they beat Llanelli 11-0 at Stradey Park. It was so windy that the authorities closed the temporary grandstand erected along the touchline adjacent to the old cricket pitch on safety grounds. Spectators heading away from the ground later in the day were advised on which routes to take back to the town centre to avoid falling masonry.